Ramaphoria to Ramaphobia: One step forward and two steps back? Paul Hoffman explores. The thought leaders of SA have identified the future response of the Ramaphosa administration to grand corruption and the attempted capture of the state as a critical marker for determining whether the future is going to hold more of the “same-old-same-old” attitudes and platitudes in the corridors of governmental and political party power, or whether the new dawn heralded by the new president will be followed by wholesome, systemically focused sunlight – the best disinfectant available for straightening out that which is crooked in any society. Commentators as diverse as academics, business leaders, civil society luminaries, economists, lawyers, politicians, pundits, public administration specialists and others are ad idem that unless the system is reformed a rocky road lies ahead. There is a great deal of work to be done both in relation to serious corruption and in redressing the attempted capture of the state. The spectre of possibly becoming a failed state ought to focus minds to act (not talk) with urgency. An examination of the facts ought properly to precede the drawing of inferences and conclusions about the seriousness with which the new administration is tackling and will deal with these issues. The known facts present a mixed bag: inertia, or perhaps some hesitation to act appropriately, is discernible, as are the seeds of possible changes for the better. A few show trials of obvious culprits like Jacob Zuma, for treasonous dereliction of his duty as president, Tom Moyane for sabotaging SARS, Brian Molefe for looting the state owned enterprises and so on will not do. Systemic changes that herald a fundamentally new approach in governance are the only means of ensuring that there will be no repeat of the catastrophic decline due to malfeasance with impunity in the Zuma years. While it is so that the Zondo Commission into state capture will start its formal work in August 2018, it is inescapable that it was first required to act in October 2016 by then outgoing Public Protector Thuli Madonsela. While the delay is partly attributable to the customary ducking and diving of Jacob Zuma in the courts, a more muscular and pro-active Ramaphosa could have taken the initiative in relation to the appointment of a commission at a much earlier stage and in his capacity as Deputy President in the Zuma administration. He did not, presumably for political reasons that played out at Nasrec in December 2017. The results at Nasrec have left the ANC deeply divided and still in the thrall of individuals and factions who appear to think that entering politics is a means of enriching oneself rather than for rendering service to the people who faithfully elect representatives. These are the self-same representatives against whom they mount service delivery protests, again and again both in elections and, shortly thereafter, on the protest front. Roots of Corruption. More of Zapiro’s brilliant work available at www.zapiro.com. 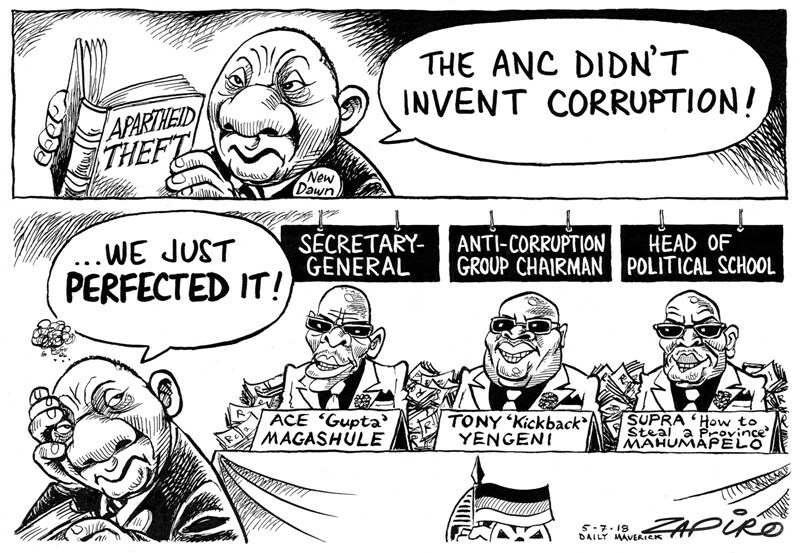 The execrable defence of arms deal beneficiary Tony Yengeni (now head of crime and corruption at Luthuli House despite a serious fraud conviction) by Jessie Duarte (herself no stranger to the wrong side of the law) illustrates the venality of ANC bigwigs. Surely a more appropriate candidate than Yengeni could have been found for the important work he does not do? Apparently not. If a mere eighty delegates out of about 4000 cadres at Nasrec had cast their votes differently in the presidential election of the ANC, then Ramaphosa would still be deputy to Zuma in the national cabinet. The decisive factor appears to have been the “unity” approach of DD Mabuza, the canny but corrupt leader of the ANC in Mpumalanga. His canniness has been rewarded with the deputy presidency of both party and state. The allegations of corruption against him remain un-investigated and no prosecution seems likely due to the massive IOU he engineered at Nasrec. This type of “royal game” status is intolerable in a constitutional democracy under the rule of law. Businessman Fred Daniel has the smoking gun evidence on Mabuza but the authorities remain indifferent. Another member of the Zuma era Premier League, Ace Magashule, has found his way into the office of Secretary General of the ANC rather than into the dock of a criminal court for the Estina debacle and other similar capers in the Free State. Of the Premier League, only Supra Mahumapelo has been dishonourably discharged as Premier of the North West, but, somewhat awkwardly, he remains chair of the ANC in that benighted province. Popular demand, rather than principled decision-making, appears to have prompted this unwieldy compromise, forged to avoid a major ANC split. If Ramaphosa was really serious about routing the rogues in his party and its structures, he ought, upon election as ANC president last December, to have immediately inspanned the internal disciplinary machinery of the ANC to suspend, investigate, charge and discipline appropriately all NEC members with corruption allegations in their past, convictions involving dishonesty and connections to the attempted capture of the state whether in cahoots with the Guptas or via their own patronage networks. Any moves of this nature are politically impossible at this stage due to the dangers of factionalism and the possibility of the threatened split in the ANC materialising. Whether appropriate disciplinary steps to clean up ANC leadership will ever become possible will depend on the outcome of the general election in 2019. It seems unlikely that Ramaphosa will be given a sufficiently strong mandate to clean his Augean stables thoroughly. Like Heracles in Greek mythology, Ramaphosa will have to reroute a couple of rivers to remove the filthy dung of 24 years of incumbency from the ANC’s stables. It will take a strong flowing river to remove Magashule and Mabuza, both of whom have well entrenched patronage networks built during their long years as provincial premiers. If the ANC is not up to the task of dealing with corruption and state capture appropriately, will the state ever be able to do so, assuming that the ANC remains in office, either alone or as a member of a coalition after the elections due by mid-2019? Here again, the indications are not propitious. The Scorpions, an effective anti-corruption unit in the National Prosecuting Authority, were disbanded following an urgent resolution of the ANC at its Polokwane conference in December 2007 at which Jacob Zuma, then under investigation by the Scorpions, swept to power. Eleven long hard years later Zuma is facing the charges worked up by the Scorpions, due to dogged DA litigation rather than any effort on the part of Ramaphosa. The Scorpions’ disbandment has been contested and the courts have repeatedly ruled that adequately independent anti-corruption machinery of state is required to deal effectively and efficiently with the malady of corruption “before it graduates into something terminal” to use the famous phrase of the Chief Justice. The criteria by which an anti-corruption entity is to be measured include specialisation, training, independence, resourcing and security of tenure of office – these yardsticks have become known as the STIRS criteria. These criteria have been the law of the land since March 2011, but the ANC has done as little as possible to implement them, preferring to persist with the tame and under-performing Hawks, a mere police unit with a “priority crime” mandate. No “big fish” has ever been successfully prosecuted following an investigation by the Hawks. Their stillborn investigation of Pravin Gordhan, certainly a big fish, illustrates how the Hawks are lacking in all STIRS criteria laid down in binding terms by the highest court in SA. The Hawks have allowed themselves to become pawns of factionalism in the ANC. There is absolutely no indication that the Ramaphosa administration has any plans to address the systemic shortcomings of the Hawks. Appointing a new leader to drive the broken under-designed machine that is the Hawks won’t do. Perturbingly government persists with a deeply unconstitutional Anti-Corruption Task Team (ACTT) despite the insistence of the courts on a single entity approach. The ACTT is even more dysfunctional than the Hawks. It has not ever successfully prosecuted any opposed criminal trial to conviction, preferring to do plea bargains of the kind that see a host of Travelgate fraudsters and other birds of that feather in the cabinet and other high office instead of in orange overalls or in disgraced retirement. Like Tony Yengeni, who actually served time, their political careers continue with impunity as they effortlessly segue from criminal court dock to political office. The ANC ought to suffer at the polls for being soft on corruption, too forgiving of the corrupt and willing to take the considerable downside of a culture of impunity in its stride. The stout defences, a la Duarte, of the corrupt, the decision to appoint Bheki Cele, fired for incompetence and dishonesty as commissioner of police, as Ramaphosa’s Minister of Police, point to a “business as usual” approach to corruption in general and state capture in particular by the new administration. When Cele was dismissed the Moloi board of inquiry recommended that he be criminally investigated. He was not. 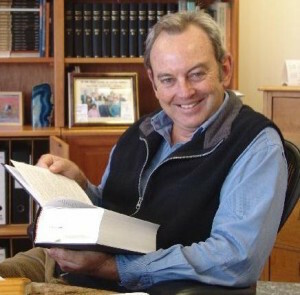 To compound the dire state of affairs on the institutional level, it seems that the National Development Plan, insofar as it deals with the high level of corruption that has developed and grown on the ANC’s watch, was written without regard to the binding Constitutional Court judgment in March 2011 in the second round of the Glenister litigation. No mention of the judgment is made in the NDP. Those punting the notion of an ACTT, also inconsistent with what the courts have ordered and accordingly illegal, at least give the case law a mention in a footnote, but they too deride and seek to circumvent the ruling that a single entity approach is required in SA. A further complicating factor is that the police service is dysfunctional and is also not aligned with constitutional values. The Hawks, unfortunately so, are a police unit. The NDP has, to its credit, recommended the demilitarisation of the police. The idea of the police operating as a service to the people rather than as a force to be used against them is central to the new dispensation ushered in when liberation dawned in 1994. The NDP is the policy of the ANC, but the notion of demilitarising the police has not been acted upon in any way, shape or form. After the Marikana massacre, a “kragdadige” move on any version, the Farlam Commission drew attention to the NDP’s recommendation regarding the demilitarisation and suggested that this step be taken as a matter of urgency as part of the remediation of the circumstances that led to the tragedy. The Zuma government accepted the recommendations of the Farlam Commission but absolutely nothing has been done to address the demilitarisation issue. Even entreaties to the police portfolio committee of the National Assembly have fallen on deaf ears. Now the man who actually militarised the police is the incumbent minister and is not in the dock for attempting to lease police headquarters in Pretoria and Durban at extortionate rental rates. During the ANC years in office the police service, like all other facets of the public administration, has become a site of cadre deployment. This practice is a key aspect of the “national democratic revolution” which is pursued by the ANC and which is intended to secure hegemonic control of all levers of power in society (not only the public administration). Needless to say, the practice of cadre deployment in the public administration is deeply and darkly unconstitutional. The High Court has so ruled and the ANC, wisely advised, has not appealed the ruling because it is sound in law. Cadre deployment creates an inherent conflict of interest in most cadres deployed in the public administration in general and the police in particular. The cadres’ loyalty to the political organisation is routinely allowed to trump the legal requirement that the lawful policies of the government of the day be implemented by the police and other elements of the public administration in accordance with the rule of law, not the whim and direction of cadre deployment committees at Luthuli House. There is no indication whatsoever that the new brooms in the Union Buildings intend to change anything at all as regards cadre deployment in the public administration. Some observers have noted that this practice has turned the ANC into a massive employment agency that has the state and state owned enterprises as its main clients. This form of patronage is a fertile field for grand corruption, job selling and perversion of the constitutional ethos of the new SA. A failure to address cadre deployment so as to confine it to strictly political positions amounts to two steps backwards in the fight against corruption. Indeed, the main enabling cause of the attempted capture of the state is in fact cadre deployment. When loyalty to party leaders is allowed to trump loyal to state and the people, the capture of the state for nefarious ends is facilitated. The Zondo Commission will do well to pay close attention to this aspect of its work. Fears that it will be a reprise of the Seriti Commission are hopefully ill-founded, although the slow start and technical issues that haunt the Zondo Commission are worrisome. Some commentators are impressed by the establishment of the Zondo and Nugent commissions into state capture and the state of SARS respectively. While these fact finding endeavours have their place, they are all too often called into existence and resourced in order to kick a political hot potato into touch for as long as possible. While the Nugent commission has since its appointment in May, leapt into action with commendable diligence and without delay, the same cannot be said of the Zondo commission, which is becoming a dreary illustration of the “failure to launch” syndrome. The fact finding work of the two commissions, using inquisitorial means, and the recommendations they reach are not binding on anyone and can be rejected both by the state and civil society. Due to the #Guptaleaks and some fine investigative journalism, both in the press and in serious works of non-fiction written by investigative journalists, the finding of relevant material is not going to present a problem to either commission. What is done with the reports of the commissioners and with their recommendations by the Ramaphosa administration remains to be seen. Their existence does afford some breathing space which can morph into an excuse for delaying implementation of urgently needed reform. As regards clawing back for the state and the people those funds and assets that have been misappropriated by the corrupt and the would-be state capturers, the news is not good. The Asset Forfeiture Unit of the NPA has done a worrisome “Keystone Cops” act on the Estina Dairy debacle: so much so that there are concerns in some quarters that the case has been thrown deliberately by Shaun Abrahams in his capacity as the “safe pair of hands” appointed by Jacob Zuma with a view to keeping Zuma and his friends and family out of trouble with the law. Abrahams has yet to sue for defamation and shows no sign of resigning, instead he clings tenaciously to his slim hopes in an appeal against a High Court Full Bench ruling that he must be replaced. Given that the #Guptaleaks have been in the public domain for more than a year, it is reasonable to expect that by now there would be news of government’s international efforts in the civil courts of foreign jurisdictions to recover assets stripped and “exported” during state capture. News is overdue that steps have been undertaken by the state and the state owned enterprises that were the victims of the misappropriation of funds. The McKinsey deal is the one swallow that does not a summer make. The efforts of Lord Peter Hain and those in the know in the international debt recovery business have passed the Ramaphosa administration by, despite his “talk” of seeking to recover the loot, no “walk” is yet in evidence. Instead it is left to NGOs to take steps that the government should have long since taken. The Helen Suzman Foundation has launched an ambitious judicial review application of questionable Eskom procurements in the local High Court with a view to having them set aside. The High Court does not have jurisdiction in respect of assets and funds taken off-shore, these have to be properly followed up by taking legal steps in the courts of the countries where they are now located and are, at least for now, traceable through the banking systems in place. The failure to act to recover assets “diligently and without delay”, as constitutionally prescribed, points to a lack of political will to prevent the corrupt from making off with their spoils. then, and only then, may it be said with conviction that he is dealing systematically and properly with the rogues who came so close to success with their various state capture projects. Business as usual won’t do and lip service to the idea of being against corruption (who isn’t?) without concomitant action won’t cut it. While the dysfunctionality of the Hawks can be litigated, the need to do so will signal the failure of the Ramaphosa administration to get to grips with the hard work involved in undoing the damage caused during the Zuma era and earlier too. Reform of the system, jettisoning of the corrupt in high governmental and party political office and adherence to the rule of law and the Constitution in all that government does is strong medicine, it is the remedy that is required, but whether Ramaphosa has the political will to do what is necessary remains to be seen. His dilemma is that if he doesn’t act the ANC may lose power in the next election, but if he does address corruption appropriately, he may split the ANC almost down the middle into factions that are or are not soft on corruption. The slide from Ramaphoria to Ramaphobia may turn out to be a more rapid process than many expected. It is up to voters to hold politicians to account.